BIG HITTER: South Barwon keeper Phil Lang watches as Geelong City's Richie Oliver blasts his way to 148. Geelong Cricket Club won the toss last Saturday and sent Prahran in to bat on a wicket that looked like it might assist the bowlers. Early on the decision looked sound as the visitors collapsed to be 2/17, with Jake Reed (4/64) and Dom McGlinchey (2/52) looked menacing. But a series of solid partnerships, punctuated by a magnificent 165 to future star Will Sutherland, saw Prahran make its way to 290 all-out. Geelong had to face a nervous 10 overs, losing Mitch Reid for a duck before steadying to be 1/35 at stumps. With a full day of cricket toe played tomorrow, the Cats might be slightly in the box seat but they will still need to bat exceptionally well to chase down this one. In Geelong Cricket Association, Richie Oliver has done it again, posting a majestic 148 to see Geelong City set South Barwon a target of 351 for victory tomorrow. Oliver enjoyed great support from Cody Brogden (59) in a 146-run opening stand, while Chris Bambury (37) ensured the good start did not go to waste. For South Barwon, Nick Lynch (4/84) toiled hard but the rest of the bowlers failed to find any inroads on a flat Richmond Cres wicket. 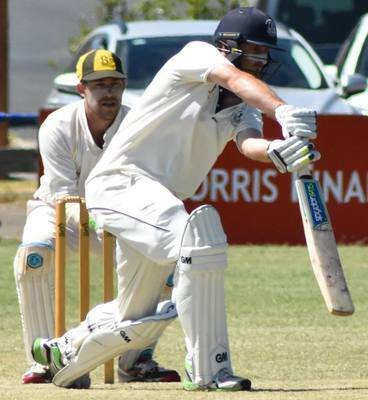 South Barwon will look to gun bat Joel Davies to make a big score if the side’s to be a chance in this one but even he will struggle to chase down such a mammoth total. James Menzies (4/18) starred against his old side as the Tigers could only manage a paltry 75. In reply, Jake Hilton (55) and Josh Janssen (54) ensured victory on day one was a formality as the side cruised to finish the day on 7/163. Marshall will most likely declare on its overnight score to give itself the maximum amount of time to bowl Thomson out again and possibly chase down any runs required for maximum points. And in division three, Teesdale can just about kiss their season goodbye if it can’t run down Bannockburn’s imposing 9/325 tomorrow. Nathan Broster (113*) was the mainstay of the Bulls’ innings, although Daniel Davies (77) was also important. Teedale struggled all day to make inroads with the ball, although Marcus Campbell (3/27) tried hard for his team. Bannockburn should win comfortably tomorrow, ending Teesdale’s finals aspirations in the process.